When I was younger my mom would often sew up beautiful outfits for my sister and I to wear on our birthdays and at holiday times. It was always fun to have something unique and it made for wonderful photo opportunities! This is why I was so excited to learn to sew. I would be able to pass on the tradition of homemade, one of a kind outfits….and for Christmas 2010 that is exactly what I did! We visited Three Forks Montana for Christmas this year. Three Forks is a cute little town about 30 minutes out of Bozeman where my husband and his family grew up. 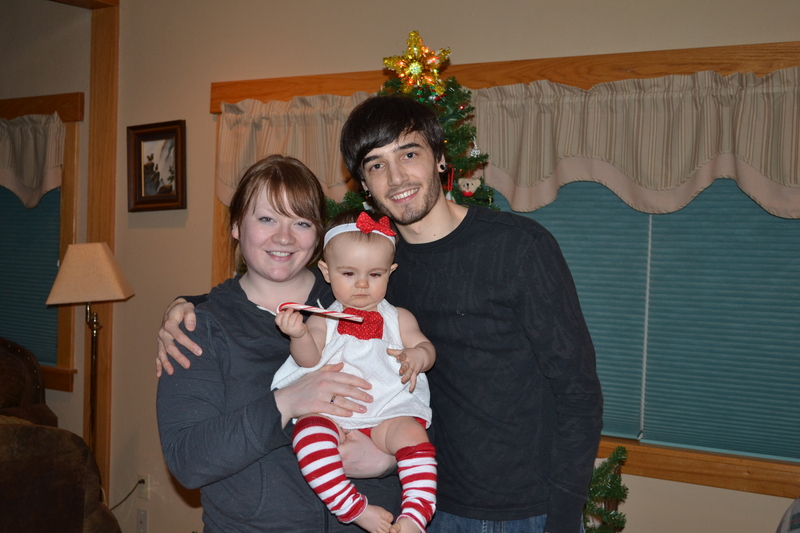 That is where my in laws still live, and we were excited to take Penelope there for her first Christmas celebration. 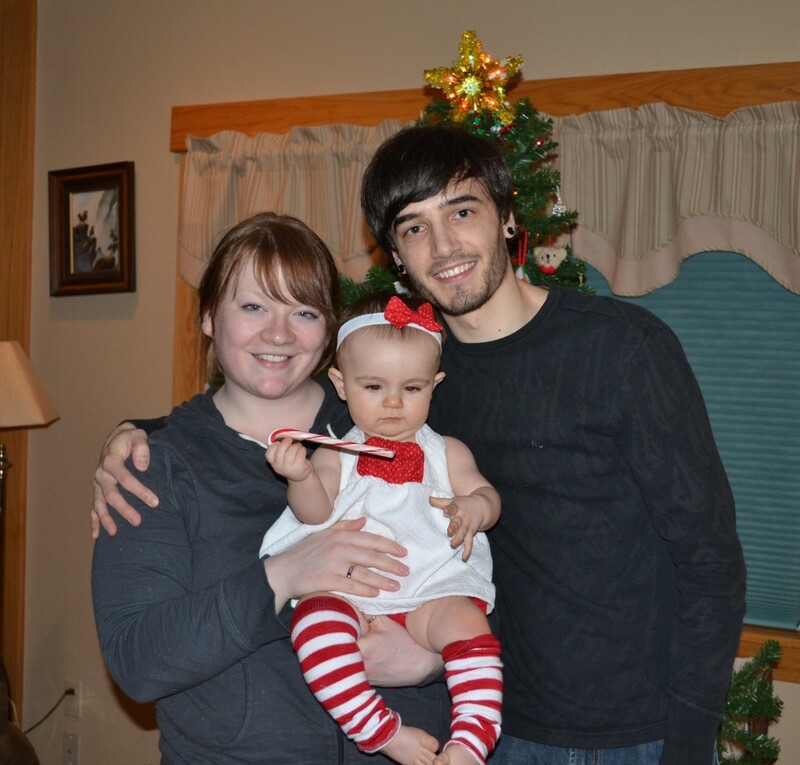 I knew that the house would be FULL of family friends and relatives all excited to see baby Penelope. The pressure was on! 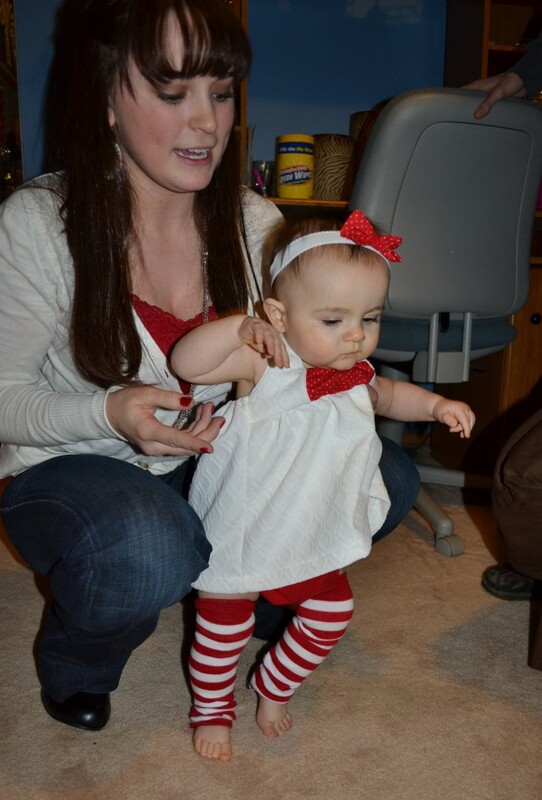 I had to make an absolutely adorable outfit for my little one to prance around in. I found the pattern I planned to use to make Penelope’s dress on Etsy. 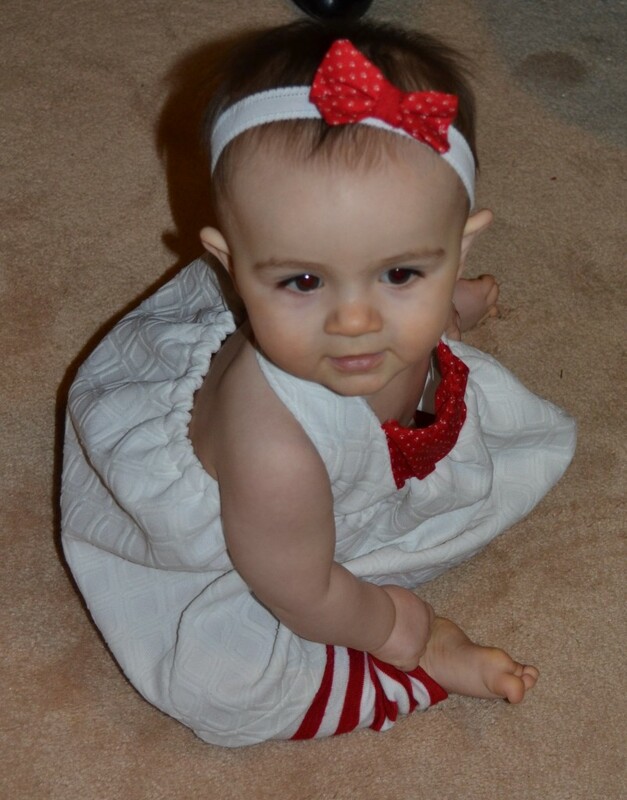 It was a cute little halter style dress pattern made by Pink Poodle Bows. I recommend you check out her amazing shop! It has lots of cute and easy to sew patterns or things that are already sewn up and ready to wear for those of you that don’t like to sit down at a machine. I had just the right fabric for the job! A while back a family friend had given me a bag full of delicious textiles. My favorite was a white on white diamond patterned fabric that looks like it would have been made into a Jackie O suit in the 60′s. I decided to pair it with some bright cheery red cotton and candy striped leg warmers made from knee high socks found at Target. I pulled out my stash and got to work. I was delighted to find that the dress pattern was so super simple that I was able to finish the entire dress in about an hour! 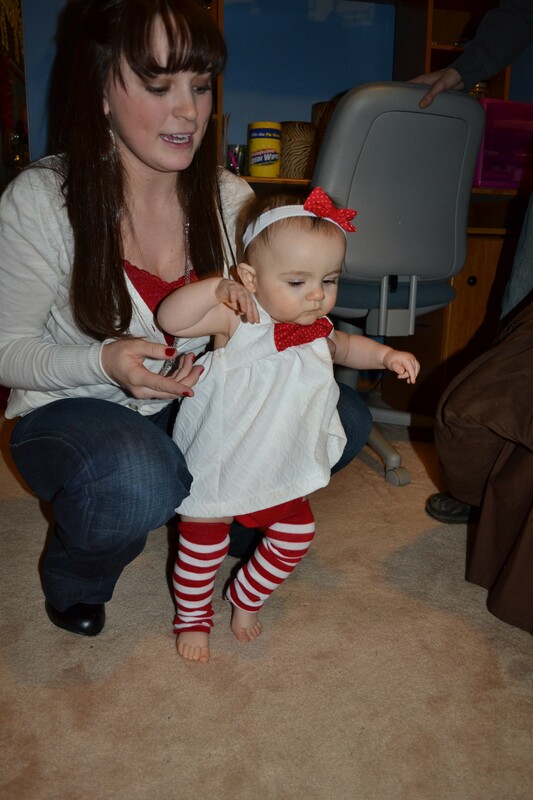 I then made a matching headband with a red bow and reworked the knee highs into baby friendly leg warmers. Lastly, I found a red shrug sweater on sale at Kohls as a backup to keep Penelope warm just in case she got too chilly in the halter. I’m extremely happy with how the outfit turned out! I plan to make lots of summer dresses for her using the same pattern. 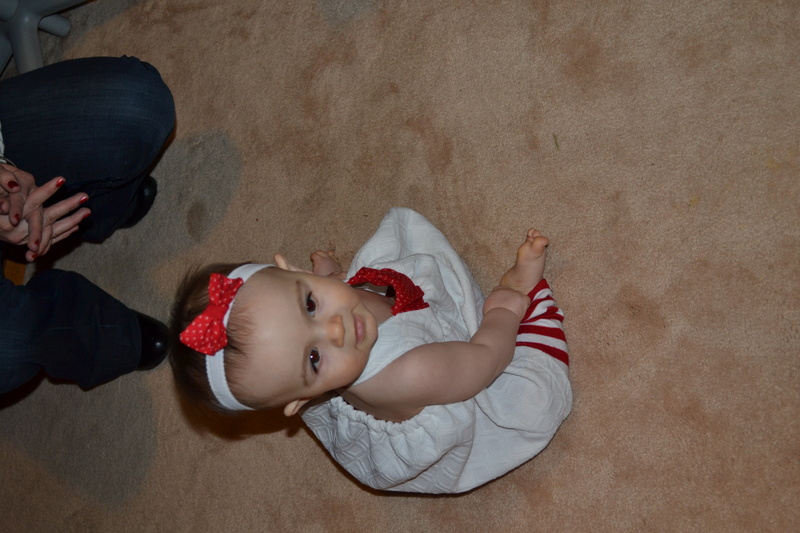 my next post will be all about the planning and execution of a very special day…Penelope’s FIRST BIRTHDAY! This entry was posted in Crafts, Saving Money, Sewing.